Kolan Shire, an area of 2655 sq km and generally 50 km west of Bundaberg, was amalgamated with Bundaberg City, Burnett Shire and Isis Shire in 2008 to form Bundaberg Regional Council. The Kolan River flows through the former shire from the Burnett River to the coast, north of Burnett Heads. It was named after the Colanne pastoral run, c1855. The shire began as the Kolan local-government division in 1879, from which was severed the Gooburrum division, the more populous eastern part, in 1886. (Gooburrum was incorporated into the Burnett Shire in 1994.) The modified Kolan division, approximating the modern shire, had the Burnett Range on its west and the small town of Wallaville on its east. 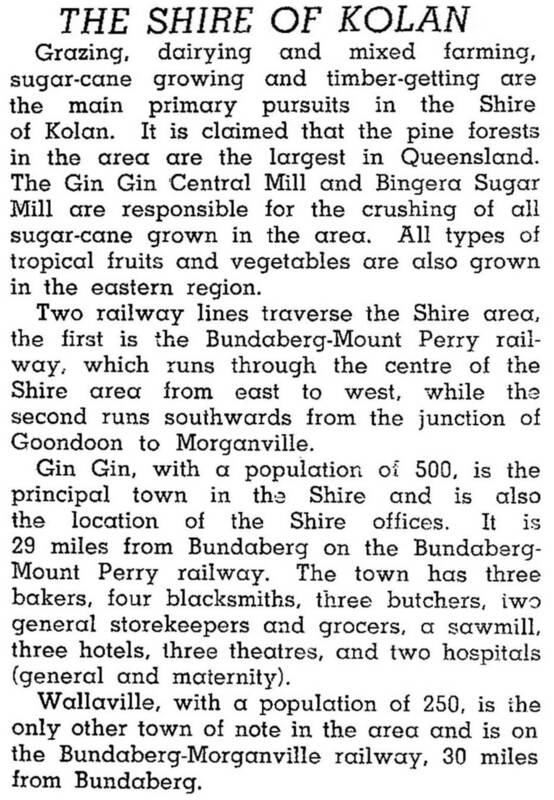 Early pastoral occupations of the Kolan division included Gingin (1848) (the origin of the Shire's administrative centre, Gin Gin), Walla (1849) and Monduran (1857), one of William Landsborough's many speculations. Copper and other mining at New Moonta in the west of the shire and at Mount Perry led to the opening of a railway line across the shire from Bundaberg in 1881-82. Apart from mining outputs, the line transported large volumes of maize and timber; the Goodnight Scrub was a prolific self-generating source of Hoop Pine. Sugar-cane cultivation was extensive, and a central mill was opened at Gin Gin in 1876. A second, branch railway line was run southwards to Wallaville in 1920. By that time Wallaville, begun with a store hotel in 1895, sustained a sugar mill, along with maize and pig raising. Somewhat isolated, Wallaville boasted an impressive Queenslander hotel, a school of arts and a progress association. The line was closed in 1964. Since the 1960s the shire's population has increased by about 70%. Proximity to Bundaberg has partly contributed to this rise, and the population of Gin Gin has increased by a hundred or so. In 1977 the Monduran Dam (since named the Fred Haigh Dam) on the Kolan River, north of Gin Gin, began to flow. It supplies water to the local sugar industry along with farms in Isis and Bundaberg. In 1993 nearly 340,000 tonnes of sugar cane from Kolan shire were crushed. Tomatoes and other field crops were also grown, and 51,000 beef cattle were grazed. Agriculture was the shire's leading employment sector in the 2001 census, accounting for 34.2% of total employment.